Cost Per thousand Model (CPM): Cost per one thousand impressions. 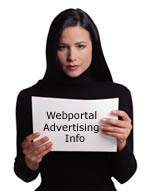 Web sites today are moving towards a cost per thousand model (CPM) for advertising. This model allows advertisers to make valuable comparison across a variety of web sites by giving an indication of how much one impression will cost. For instance a CPM of RM 20 translates into a cost of 2 cents per impression. It gives you a rate based on the number of times your ad will be served to a user but not just the potential number of people who may see your ad like other advertising. Eye-Ball: As the name suggests, eye-ball is normally used in reference to the ability of a single person to view your page/banner. The more eye-balls a page is able to generate, the more 'hits' the page is getting. Normally, 1 eye-ball refers to one person's ability to view the page though normally each person has two eye-balls. Flat Fee Advertising: Banner advertising calculated by some period of time, like one week or one month the banner ad will appear on the advertising site. Charges do not related to the number of impressions or click-through. Gif or Jpg : Two particular graphical file formats commonly used for banner images. Hit : An entry in the log file of a Web server. A hit is generated by every request made to a Web server. Calculate based on the total number of files down loaded from an individual site. It is quite common for a single web page to be made up of over twenty files therefore `Hits' can give an inflated and subsequently unreliable estimate of visits. Impressions and Hits - What's The Difference? An impression is counted when an Internet user views a page on a particular site that an advertisement appears on. An impression based model is a more accurate measurement barometer to base advertising on than terms such as `Hits' which only calculate a figure based on the total number of files down loaded from an individual site. It is quite common for a single Web page to be made up of over twenty files therefore `Hits' can give an inflated and subsequently unreliable estimate of visits. Page : An HTML document that may contain text, images, and other on-line elements. It may be static or dynamically generated. It may be a stand-alone HTML document, or page which is contained within a frame.